We have two full time programmers to help customers with their need for changes, additions, repairs or replacements. As the long-time full service distributor of our competitors equipment, we have the experience and know-how to conduct repairs or additions to competitive PLC systems. We supplement this knowledge with our UL 508 control panel shop where we fabricate direct replacement panels of our competitors products. We perform custom work all the time and can perform commissioning and checkout of competitor’s fuel control systems. We can often be more cost competitive than the OEM supplier. Fuel Oil Systems can diagnose and repair Preferred Utilities systems. We are capable of performing additions and modifications to existing Preferred Utilities systems. We have performed this work from Chicago to Alaska. We have performed re-programming and repair on Earthsafe systems. 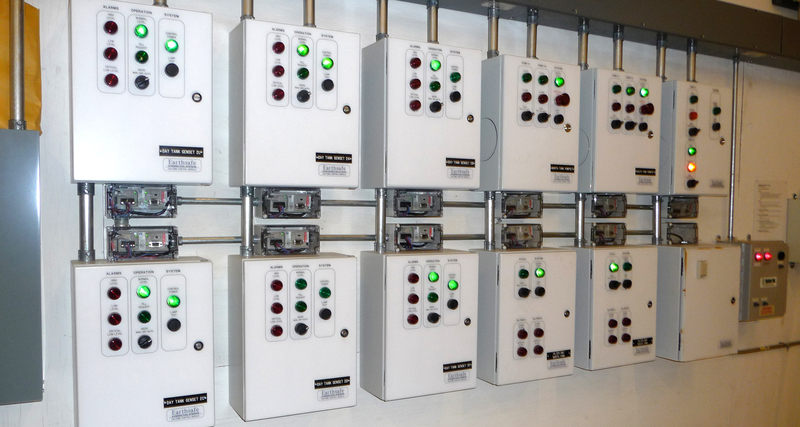 We can even build a replacement PLC panel where a single unit in a system has been damaged. We are capable of performing additions to existing Earthsafe systems. Fuel Oil Systems can diagnose and repair Simplex systems. We are capable of performing additions and modifications to existing Simplex systems. Our programmers come from the Manufacturing environment and have resolved problems on sites installed by others. They understand closed loop process control and can help with localized and network problems.